Perfection Architectural Systems is a leader in engineered aluminum walkway covers, canopies and sunshade systems in Georgia. The heart of every project is a steadfast commitment to quality and workmanship that cannot be emulated by any competitor. This means consigning to only the best materials and the most proficient experts to provide your aluminum architectural solutions. Exceeding expectations for clients isn’t going the extra mile for Perfection-it is the standard. Perfection Architectural Systems not only specializes in suspended canopies, walkway covers, and sunshades, but also offers customized carport, trellis, pavilion, and solar panel support solutions in Georgia. These are all available in standard and custom finishes that will dynamically complement the environment of your establishment. Employees are trained extensively in maintaining the tradition of Perfection Architectural Systems-diligent work and exceptional, personalized service. With 18 years of diverse work in the industry, Perfection Architectural Systems has shaped their ability to work remarkably with clients of all backgrounds and needs. Perfection Architectural Systems takes pride in offering services that many others in the industry do not. The Quick Ship Program gives you the option to implement standard canopy systems in a fraction of the time. These systems are pre-engineered and constructed with 100% extruded aluminum with stainless steel fasteners. Perfection Architectural Systems also offers a range of construction options that are keen to green initiatives. This includes using eco-friendly materials and carefully analyzing your scope of work to eliminate excess material scrap. 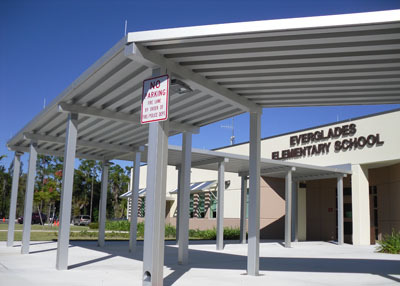 Perfection Architectural Systems offers aluminum canopy systems that possess longevity and endurance, while still leaving the smallest carbon footprint. Since our founding in 1993, the quality of workmanship and ability to assist clients diligently have been renowned characteristic of the company. Call Perfection Architectural Systems today at (800)238-7207 and get your next project in Georgia started.